Four more Transformers movies could be just the beginning for Hasbro and its treasure trove of intellectual property. 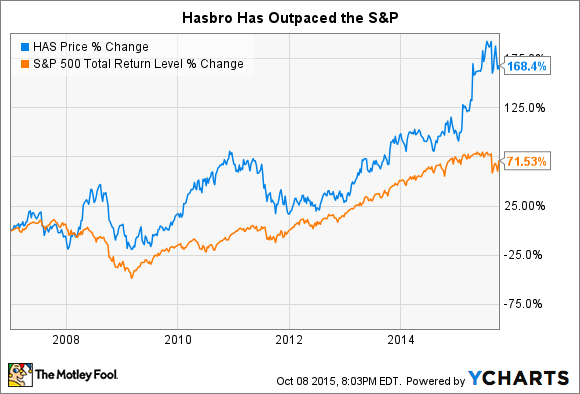 Hasbro (NASDAQ:HAS) relies on a massive portfolio of beloved brands to generate over $4 billion in revenue annually. Perhaps more impressive is that it's able to generate a profit margin upward of 10% selling what would otherwise be commoditized pieces of plastic and other materials. Part of Hasbro's secret sauce is partnering with companies such as Disney to produce toys in lockstep with the release of massively popular films. Since 2007 Hasbro has taken one of its own toy properties, Transformers, and helped turn it into a four-movie series grossing more than $3.5 billion worldwide. While reviews for the films haven't been stellar, they have surely been very lucrative. Attempting to get all it can out of this franchise, Hasbro recently announced that it will produce at least four more films to be released over the next decade.While this may be bad news for cinephiles, it will most likely be very good for Hasbro shareholders, who have already been handsomely rewarded since the year of the first film's release. While the Transformers series has been a success at the domestic box office, where it has grossed over $1.3 billion, worldwide gross has been truly staggering at nearly $3.8 billion. These movies clearly play well overseas, have exportable themes, and are not trying to reinvent the wheel. Auteurs and critics enjoy pushing into new creative area,s but investors crave predictability. These next four movies stand to make billions of dollars more. The expansion of IMAX, which gives a viewing experience impossible to approximate at home and charges a premium to regular theater tickets, should help to bolster sales for these movies. The more special effects, explosions, and action in a movie, the more IMAX adds to the experience. Watching The Godfather on IMAX wouldn't do much, if anything, to increase my viewing please. For a couple of hours of popcorn, candy, soda, and escapism, which Transformers provides, it may be just what consumers want. Hasbro's decision to continue to produce these films as long as they are economic hits is a prudent business move. We live in a world where Disney continues to pump out superhero movies, Batman is being rebooted for the umpteenth time, and 10 Fast & Furious movies looks like a distinct possibility. Hasbro has a number of great brands that could be leveraged much in the same way as Transformers. It has already tried its hand with a few big-budget action films based on G.I. Joe and Battleship that did not perform nearly as well as hoped for. It did find a sleeper hit in a lower-budget horror film based on Ouija that grossed over $100 million worldwide on a $5 million production budget. While Battleship 2 is not in the works, Ouija 2 is. It's a low-risk move that should yield solid returns for the company. Coming down the pike Hasbro has films based on Monopoly, Magic: The Gathering, Play-Doh, Dungeons & Dragons, and others. While some of these will likely not live up to expectations or be downright flops, once success could lead to eight or more movies in the series for decades to come. Transformers is important now because it is gushing cash, but is perhaps more important for how it is informing the decisions that will shape Hasbro's future.